On Saturday, after spending the day in Cookstown with the good folks of the Traditional Ulster Voice party discussing, among other things, tribalism, it seemed appropriate to go to the Holyland in Belfast to check out how traditional nationalist students were celebrating St Patrick. 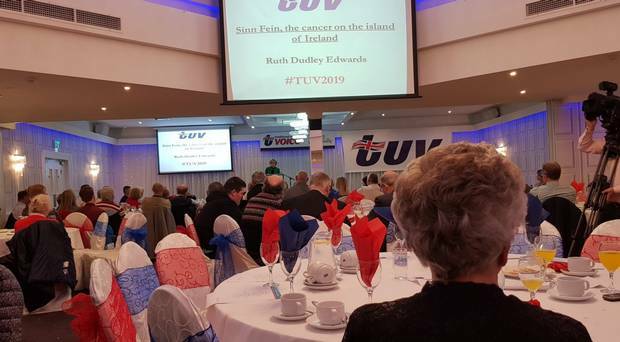 I’d been asked by the TUV to give the keynote speech at its conference, which I was happy to do. I say yes to invitations from friends and foes alike. I have one or two TUV friends and some values in common with the party, but on the foes side I’ve spoken, for instance, at a disaffected anti-Agreement republican meeting in Dublin, as well as at the West Belfast Festival. I knew that my consorting with the TUV would enrage Shinnerbot bigots on social media, but they make me laugh, so that’s okay. Asked for a title for my speech, I offered ‘Sinn Fein, a cancer on the island of Ireland’, as I like to start off with a topic I know the audience will like, and I take any opportunity I can to put the boot into the self-serving hate-mongers and wreckers who drive that party’s strategy. For instance, when talking to those not-an-inch republicans in Dublin, I was happy to say that it was wrong to call them dissidents, since it’s Sinn Fein who are the dissidents from the violent republicanism they championed until they lost to the security forces and took the Queen’s shilling. In theological terms, the present buffet of IRAs are right to say they’re the true heirs of the 1916 leaders, who started a revolution in a democracy with neither justification nor public support. But back to the TUV. I’m not religious, though I fervently back the right of Christians to defend their beliefs and values in a hostile secular environment. And though I disliked many aspects of the Belfast Good Friday Agreement they oppose, I supported it on pragmatic grounds. But I’m with them on Brexit and on the importance of integrity in public life. Packing in London on Friday, I picked up my favourite jacket and then hesitated. Might some sensitive souls think I was wearing bright green as a political statement? And then, I thought, the hell with this. I’m sick of the Shinners appropriating my country’s flag and history. Green is my favourite colour, and in my experience unionists – unlike nationalists – are rarely offence-takers on trivial issues. In fact the only person who commented on the colour was a BBC journalist and, of course, a few on social media, including some idiot who described it “as the wearing of the Green”. TUV members are nice people and I appreciated their decency, courtesy and ability to laugh at themselves. I particularly appreciated that when the chairman said they would now be singing the national anthem, he said it would be fine for me to sit it out. Of course I sang it. I consider myself British-Irish, so I lustily sing both anthems. Anyway, that evening, with two intrepid friends, I set off to observe what mayhem the young people from west of the Bann were creating in a residential area near Queen’s University that has long-suffered from their raucous celebrations. The answer was none, since although they were loading up with boxes and bags of alcohol, the cold and the rain was driving them indoors. We investigated a pub where most of the young were gazing at their phones and we couldn’t hear ourselves speak, so we too chickened out and went indoors. On Sunday morning the sun was shining and I returned to the Holyland around 9.30am to see if anyone was about. Hardly anyone was, but there was a doughty survivor of the night before shivering in a thin T-shirt and an Irish flag and staggering as he tried to get cash from an ATM despite clearly having a problem remembering his PIN number. At least he wasn’t wearing the Green.